At a family wedding last weekend I overheard the following conversation between the bride and one of her female friends. As they both were leaving the dance floor, the bride (herself strapless) hugged her similarly attired guest and exclaimed, "Ooh you are all sweaty!" The bare-shouldered young woman replied "Yeah! And its not my sweat!" "EEEEWWW!" said the bride. When I thought back on this dialog it brought to mind a scene from a recent episode of the Fox TV series "Bones" wherein the eponymous heroine of the show (aka Dr. Temperance Brennan) explains why she broke the wrist of a convicted murderer whom she was questioning at his prison visiting room. "He touched me with his icky serial killer hand." A few days later I was reading the "Hartford Stage Company Stage Notes" telling about their upcoming production of Existential Philosopher/Novelist/Playwrite Jean Paul Sartre's "No Exit". 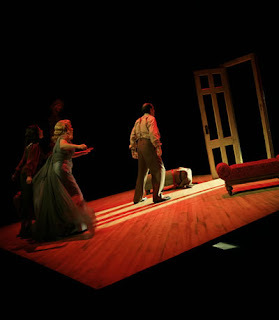 It's a story of three strangers confined to a drawing room, presumably after their deaths, who develop a complex triangular relationship in which each one's imprisonment depends upon the other two. But the play is perhaps best known for the quote "Hell is other people!" - something that both the wedding guest and the fictional forensic detective were likely legitimately feeling. Twice is an aberration, but three times is a trend. So I started thinking - is it really? Sometimes yes. 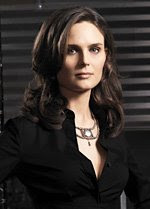 Although rarely as obvious as in Bones' incarcerated groping experience. And in those situations, the solution is not so bone-crushingly obvious. Still, even in Sartre's play - which we are being told is a comedy although the idea of a Sartre Existential Comedy is even more oxymoronic than Military Intelligence, or any of the other cliche examples - the characters could actually leave the room if they wanted. And they choose not to, in order to maintain the delicate balance of their relationships. In fact this presentation will apparently be performed on a teeter-totter stabilized platform that requires the actors to constantly adjust their positions relative to each other in order to keep their own "stage" from getting too much out of equilibrium. But perhaps most importantly - back at the wedding, within minutes of their brief conversation both the female newlywed and her friend were back out on the dance floor gyrating with the rest of the crowd. When Mars and I left about one hour later we gave the bride a hug - and I have to say that she was, well, sweaty. I didn't ask, and she didn't tell me. Who knew that Tennessee Williams was a golf writer? I certainly didn't. Not until I saw the recent production of his play "Summer and Smoke" at the Hartford Stage Company. But even then I wouldn't have realized his sports writing proclivities if I hadn't just recently discovered that I could actually call myself a player of that very same game. Mars and I went to the Golf Elderhostel at Penn State University to learn more about the sport - and, of course, other things. That's the way it is with Elderhostel vacations. On some of our previous ones we have (a) been educated about the geology, history and paleontology of the Big Bend area of Texas as well as seeing how successfully Texans and Mexicans interacted along the unguarded Rio Grande border-crossing without any outside guidance; (b) field-studied the varying physical attributes of the Grand Canyon and Sonoran Desert in Arizona; (c) studied and walked within the organic architecture of Antoni Gaudi in Barcelona; and (d) experienced the art, music, architecture, and reemergence of Budapest. - from an eighty-five year old retired military judge who apologized for his recent mountain biking injury which he hoped would be fully healed in time for his upcoming skiing trips. - and a seventyish woman who fell at a rest stop on our way to the Grand Canyon, spent a full day hiking et. al. at the site, and appeared the next morning with a fully casted broken arm with which she partook in all of the trip's remaining activities. - and from two World War II veteran widowed brothers who came to Hungary to visit for the first time the small town from which their mother migrated to America. 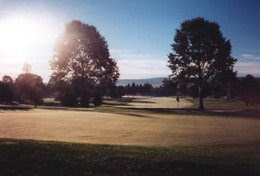 This Elderhostel was held at the golf course of Pennsylvania State University and had twenty-eight students and four teachers - the Head Coach of the Penn State Women's Golf Team (Coach Denise), her Assistant Sarah and two of the club Professionals, Steve and Josh. The curriculum was group lessons with individual attention each morning and unlimited golf playing each afternoon with the faculty on the course observing and instructing. We began with the shortest swing, the putt, and preceded incrementally to the chip, the pitch, and finally the full golf swing. The class varied in age from the early sixties to the low eighties and levels of ability/experience varied similarly - although the numbers that represent those grades of skill (i.e. the scores) were, at least in some cases, higher. One couple were neophytes. The husband, a World War II veteran had taken up skiing at the age of sixty-seven and now wanted to try golf. Mars and I like to call ourselves "fifth year beginners", having taken up the game that recently as an activity that we could continue to do together, and as a way to meet other people. Over that time we've taken indoor, videotaped lessons, initially from an English-born instructor and club-maker and then, upon his death, from his son who is carrying on both of these enterprises. And we play or practice one to two times a week during the six to seven month Connecticut golf season. Thanks to our work with John and Shaun we now both have reasonably good golf swings modeled on the classic Ben Hogan style. What we don't have is much experience exposing these swings to a variety of golf courses, or to other players with a higher level of ability. The lessons were good and the teachers excellent. The Penn State class however didn't really teach us any new things nor did anything we learned differ from what we had been taught previously. It did validate what we already knew but in a different environment (on a golf course with other golfers as opposed to in a "studio" by ourselves) which allowed us to better see for ourselves the results of what we were doing. On each of the afternoons we happened to be paired up with more experienced golfers and, happily for us, we were able to play at a comparable, occasionally better, level. Mars made one shot in particular that would have been the ESPN Highlight of the Day - a nine iron pitch that went over two cart paths and a twenty foot tree - just the way she planned it. The next day I par-threed two holes after driving my tee shots one hundred sixty yards or so onto the greens. So two weeks later I'm listening to what Miss Alma, the protagonist, concludes at the end of Summer and Smoke - "Life is full of little mercies like that, not big mercies, but comfortable little mercies. And so we are able to keep on going..." - and I'm thinking, "I know exactly what she means." Golf is about making that one perfect shot at just the right time. Life is about continuing to keep yourself in the game. Graydon Parrish's new painting, "The Cycle of Terror and Tragedy: September 11, 2001," is the sort of work that rewards detailed inspection. Figurative, allegorical and emotional, the painting was created to commemorate one of the darkest days in American history. Unveiled in recent weeks at the New Britain Museum of American Art, "The Cycle of Terror and Tragedy" is an arresting 8- by 18-foot oil-on-canvas work that occupies a single wall in the museum's new Chase Family Building. The following was overheard while Mars and I were viewing the painting. Father and mother in their mid to late thirties and (presumably) their two sons around eight to ten years of age. Father: "It's an artist's interpretation of what happened in New York City on 9/11." Son: "You mean they blindfolded the kids?" Well we finally had our first hummingbird at the house. It happened a few days ago, just after breakfast. We were sitting in the family room finishing off the morning paper when Mars suddenly shouted "Jim, look!" Which I did. At her. And she quickly added "out the window!" And there it was, a couple of inches long, green with a white throat, hovering with its blurry wings at one of our Phlox flowers, and sucking in its early morning meal. "I thought at first it was a giant green insect." said Mars. I understood what she meant. Several years ago I saw what, at the time, I thought could have been our first Hummer. But now in retrospect I think it also was in fact a "giant green insect". It startled me with its darting motion as I was working in the yard next to our official Butterfly/Hummingbird garden. The Phlox, it should be mentioned, is not located in that plot. Instead it is right up against our house in a small catchall garden containing a random assortment of perennial flowers that were given to us by various people, most of whose names we don't remember - the flora's not the home sapiens' . The Phlox came from our niece Leslie and have unassumingly grown along the back of the plot for ten or more years without, as far as we know, attracting anyone's or anything's attention. The Butterfly/Hummingbird garden is in our side yard and was started many years ago in response to the gift of a Butterfly House to us from our son. That house, it turned out, was not intended to attract anything, but instead to serve as a resting and nesting place for any Lepidoptera otherwise drawn to the area. So we ripped out some thick rooted shrubs, went to our local nursery, and planted a combination of perennials designed to attract both the large winged colorful insects and the small-winged hovering Hummers. During the Summer we also added feeders into which we poured an incredibly sticky red sugary liquid that immediately drew the interest of every ant and bee in the neighborhood. But no Hummingbirds. The garden however did and does bring in the butterflies - and the above-mentioned strange "giant green insect". It hovered and darted like a Hummer. But visually it seemed to be lacking some of the basic attributes of the tiny nectar-sucking bird, for example a visible head, a feathered tail, and a long curved bill. Within a few seconds the creature was gone. 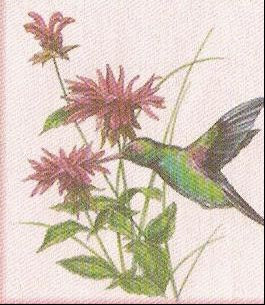 In spite of these anomalies my second reaction (my first being fear) was that this must be a Hummingbird because we had worked so hard to create a colorful cafeteria to feed them. But I had no corroborating witnesses and over a very short period of time my opinion changed. We've had plenty of definitive Hummingbird sightings in New Mexico on our many trips out there. The first time was at a motel in Taos that had a set of feeders arranged around its hacienda style courtyard. The little guys would queue up in rows of five or six at the sugar stations - impatiently waiting, and angrily tailgating those in front of them when they felt they had overstayed their sipping time. We've also seen them "in the wild" out there, flitting around in seemingly inappropriate environments like half-dead pinyon trees. And now we've had one at our own house in a not necessarily unsuitable, but somewhat surprising place. In our bedroom we have a small, wooden wall sculpture from New Mexico with the words "the best tears are unrehearsed." I guess maybe it is also true that the best joys are unorchestrated. My experiments with "Faith Based Evolutionary Gardening" continue - in spite of what others might consider failure. The theory of F.B.E.G. is that if you stick something plantlike into the ground and do basically nothing to nurture it other than to have a resolute belief that everything will turn out okay, then the plant's intrinsic desire to live will take over and it will somehow adapt and survive. Or not. Some people might think of this scientific proposition as the rationalization of a lazy gardener who is too busy doing other things, like writing about yard work, to have any time for the actual business of horticulture. To them I say, "Piffle!" On my own modest little test farm I have several pieces of evidence that prove my hypothesis. Unfortunately none of them are types of flora that anyone wants. In fact last week when I cut my lawn, the only things that I was mowing were these things that I didn't want growing - namely G.T.G. and Wild Oaks. "Gratis Town Grass" (G.T.G) is the result of the handful of seeds that the town of Wethersfield scatters onto your apron to atone for wrecking the grass that was previously there which they destroyed when they, for example, snowplowed your curb up onto your sidewalk. After replacing the tar edging, and filling in the dirt with some brown flaky substance that is somewhat similar to soil, they lightly sprinkle the general area with some kernels, and walk away. Since I've had previous experience with the end product of these little germinating devils I immediately begin to totally ignore them - no water, no fertilizer and definitely no other forms of T.L.C. In fact, in hopes of causing their rapid demise I grind the seeds under my heels, kick the earth around a lot, and shepherd several of the pigeons that frequent my yard down to the area at breakfast time. Nothing works. In spite of a complete lack of nurture and encouragement, the "grass" springs to life. Not only does it grow, but it rapidly becomes the biggest, greenest, meanest plant on my whole damn property. With roots that run to somewhere east of Shanghai. And the ability to hunker down under even the lowest of lawn mower blades, these muscular-looking green meanies can survive any attempt at removal from above or below - and still keep thriving. I'm looking down at them this very moment from my second floor study. They are just about the only green thing in my lawn - except for the Wild Oaks. This forest of tiny intruders is, I'm pretty sure, the result of the planting efforts of my resident tree rats who solve the problem of not being able to remember where they bury their acorns by basically sticking them everywhere. 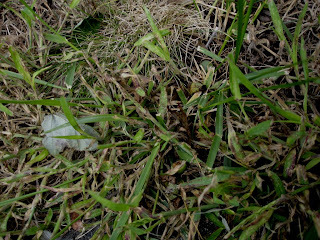 Since these ravenous rodents bury about a gazillion times more than even they can possibly eat, the residue begins to pop up on my property just about this time of year - another unwelcome emerald interloper on my otherwise lifeless brown lawn (remember F.B.E.G. applies to everything). So last weekend I set out to mow down this incipient timberland before the folks from Weyerhaeuser started building logging roads into my property. I fired up my eats-anything lawn mower confident that this mulching monster that easily decimates fallen branches and devours tossed-aside Taco Bell soda cups would quickly make mincemeat of the fragile looking little acorn byproducts. Only to find that, even after three and four passes through the mini-woodland (each one faster and angrier than the one before), my unwanted visitors were still visiting - and even more unwanted. Frustrated by failure, and tired of pushing, I dejectedly pulled my machine back to the starting point and discovered that this backward direction and therefore counterclockwise blade rotation had successfully severed all of the oak-babies from their front yard squatting spots. So given the favorable outcome of my F.B.E.G. experiments (at least as I see it) I will continue on with my pseudo-empirical studies. Next I will look into whether the world is being overrun by creeping or burrowing invertebrate animals with long, slender, soft bodies and no limbs - is there a Global Worming Crisis?